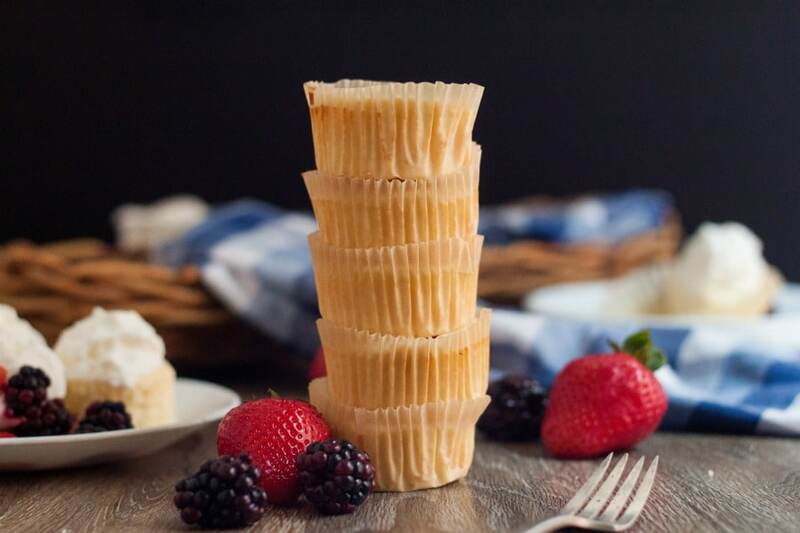 This Mini Keto Cheesecakes Recipe is a favorite way to portion control a delicious dessert. 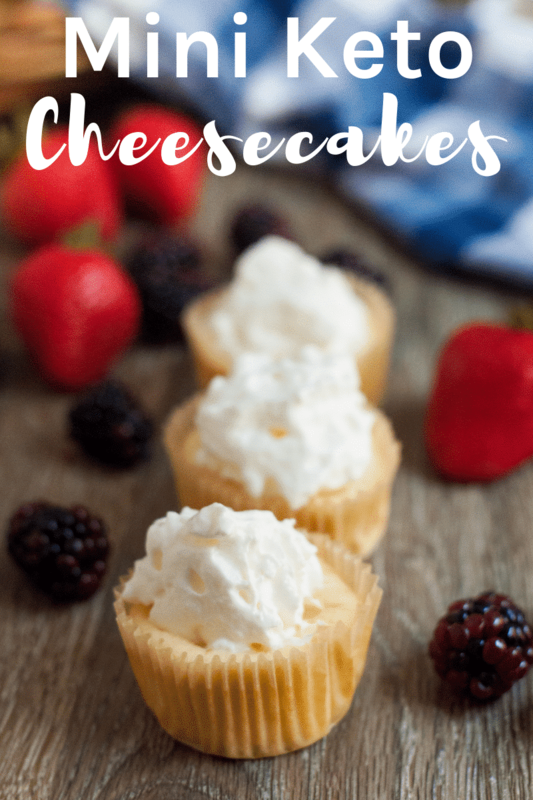 Cheesecakes are always a favorite option for dessert, and I love how keto friendly they are when you use alternative sweeteners! They display beautifully on a dessert plate when you have guests and are so good they impress friends and family. I’m in several keto Facebook groups that have been very helpful since we started following a ketogenic lifestyle. I’ve found tons of great tips and recipes, like this one, from a very old newspaper clipping that has made this transition much easier than expected. If you’ve not heard of keto, you can find a fabulous resource here that explains it in great detail. In a nutshell, we eat very high fat, moderate protein, and low carb. In the first month, I lost 9lbs and numerous inches and had more energy than I have had in a long time. It’s been very interesting as I’ve always avoided high-fat foods. In the beginning, I struggled with my mindset, but now that I know that it works I’ve been enjoying it. Here is one of our very favorite treats that are super low in carbs and delicious! 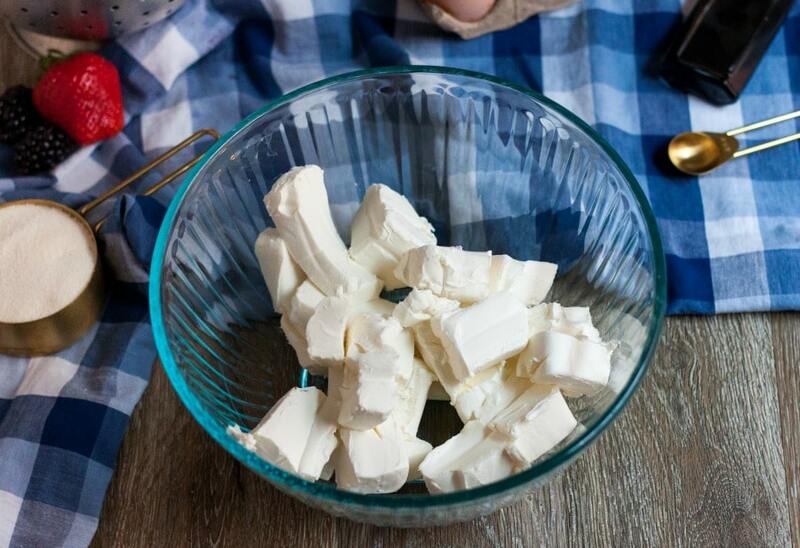 It is essential to make sure your cream cheese is softened for it to blend well. You can leave it out on the counter to soften or pop it into the microwave for a few seconds. Add the other ingredients except for the vanilla. Do you see how incredibly easy this Low Carb Cheesecakes recipe is to make? This is my kind of quick keto dessert treat. I always make sure to use 100% pure vanilla extract. It tastes so much better than the imitation. 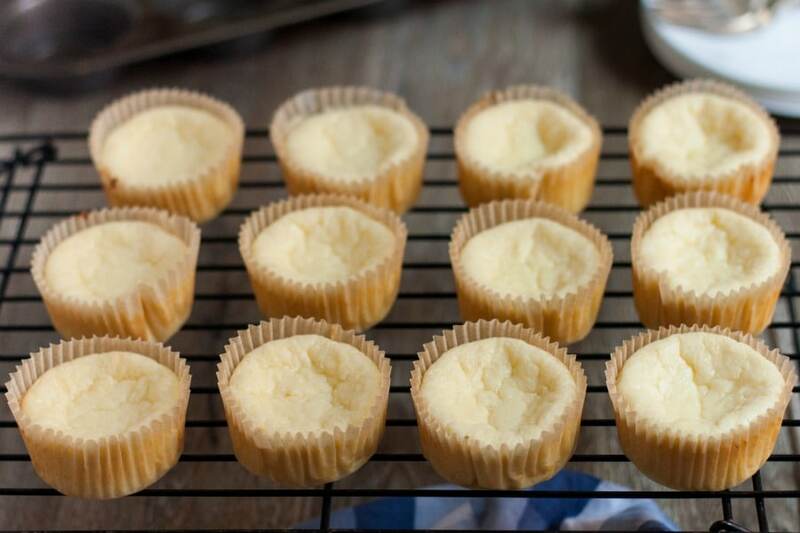 If your batter for Low Carb Mini Keto Cheesecakes seems a little lumpy, just beat it on high speed for a little longer and it will come together very smooth. Yum! They come out perfectly every single time! I recommend using parchment paper muffin liners. You can find them on Amazon here. They make such a huge difference because nothing sticks at all leaving beautiful Mini Keto Cheesecakes. 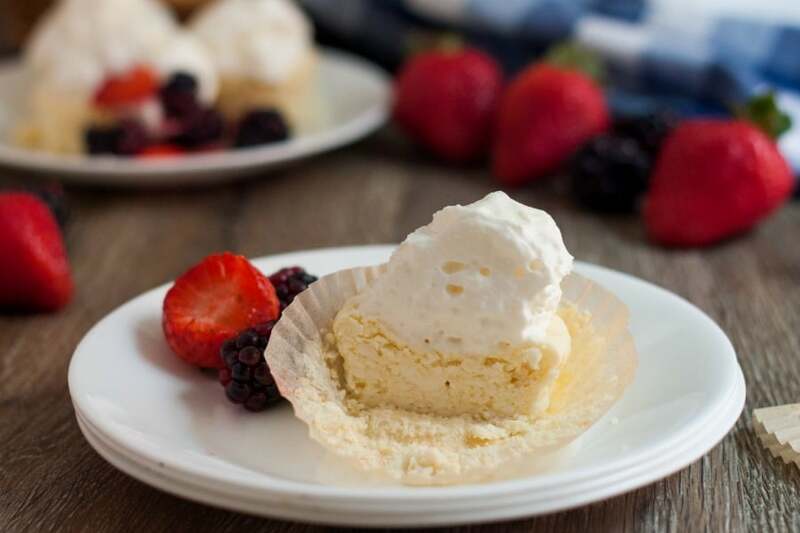 Don’t forget a couple of flavorful berries and homemade whipped topping for the Keto Cheesecakes for an out of this world treat. These are delicious all on their own, but I love serving them with some fresh whipped cream on top and some berries. You could even make an extra batch to wrap and freeze for the future. Being able to serve these for dessert has made following the keto diet so much easier to manage. I don’t feel deprived, and the entire family loves them too! Best served cold with a couple of berries and a dollop of whipped topping. The sugar alcohols from the Lakanto Monkfruit are not included in the nutritional information since most subtract to calculate net carbs. I love serving up dessert as a special treat after dinner. 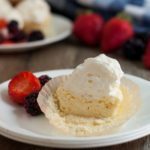 These keto cheesecakes are my favorite, but we have tons of other delicious and easy to make keto-friendly recipes. You can check out our complete Keto Recipe Index for more ideas, or check out my personal favorites listed below. I made these tonight and the middle didn’t set. Don’t k ow what I did wrong. They look just like the picture but the middle still looked like it needed to be cooked. I even left it another 10 min but same result. Hmmmm…..I’m not sure. We’ve made these so many times and each time they turn out perfectly. 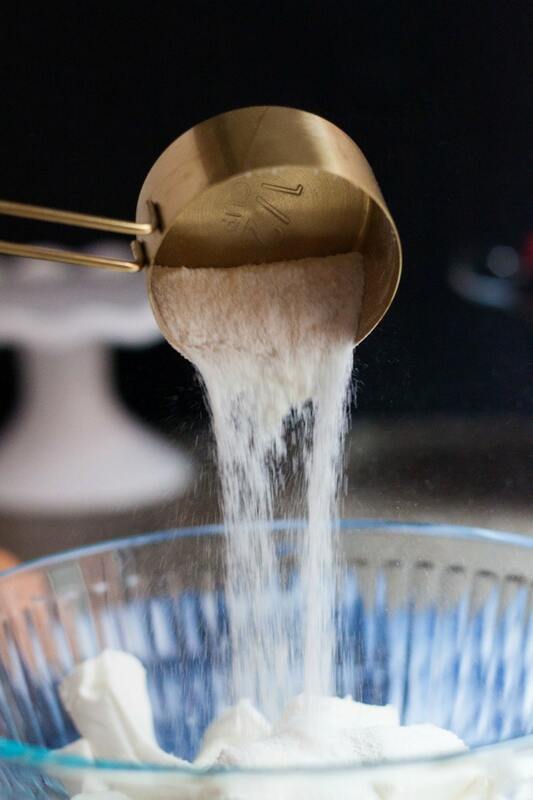 The recipe uses swerve, is this granulated or powdered swerve? I use granulated Swerve in this recipe. Can you use the powdered? I’ve only tried as is. I made these today using a different sweetener that I had on hand. They tasted fantastic and were very satisfying. I used Philadelphia cream cheese (Canada) brand. 12 servings. Sorry to advise that MFP got nutritional info WRONG … I reported problem but doubt they’ll even see my message…. The nutritional info from MFP states that each serving has 113 calories, 3g carbs, 2g fiber, 3g sugar, 4g protein, and 10g fat. NONE of the 4 items entered as ingredients in the recipe and listed below has any fiber whatsoever. Thanks so much for the updated information. I have noticed that different brands of cream cheese have varying amounts of carbs. Good deal. Thanks for commenting. my ap came up with 139 calories per muffin. I’m not concerned – what’s important is they are sugar free, gluten free, nut free, chocolate free and low carb – great for taking to a group event – Thanks for the recipe. I’m putting toppings in small bowls, so people can have what they want – chocolate, carmel, fruit and whipping cream. Awesome! Hope they are a hit! Sure don’t. Sounds good though!! What sweetner did you use? And did you use the same measurements? So excited to find this recipe! We’ve made keto cheesecake before and hated the crust. I like that this is just the filling. Perfect. Thank you for your blog! I make my keto crust with pecans, butter and your preferred keto approved sweetener. But these look delish. Might try a mixed batch! Half with crust and half without! Yum! I’ll have to try your crust recipe. If it turns out as yummy as it sounds for me, I’ll have to post it as an alternative. Thanks! I would add cinnamon to the crust – based on my momma’s recipe for cheesecake. What is the ratio for the pecan crust and butter please? There is no butter in the crust. Is it 28 oz of cheese? It’s 2 eight oz packages of cream cheese. I just made this and the flavor is wonderful! Im not sure if it baked all the way through. Is the middle supposed to be gooey? Mine isn’t usually gooey in the middle. Every oven is different. You may need to cook it a few minutes longer. Do we use mini muffin trays or regular? You can use whatever you’d like, but I used regular. Tastes great! I made these 3 times already hahaha. So glad you love them. They do tend to sink in a little. If I serve these at a party, I had a little homemade whipped cream to the top with a sprinkle of cinnamon. 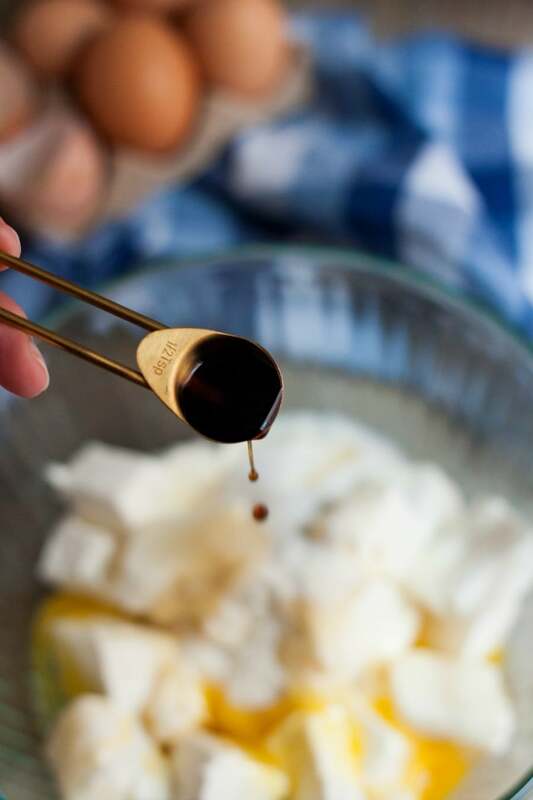 You are welcome to use your favorite sugar substitute but the taste and amount may change. Amazon carries all varieties of swerve. I’m not sure, you’ll have to test it to see if it works. WOW — SO GOOD, SO EASY! I used swerve but its gritty. Should i be using powdered swerve? Is there a trick to getting it to not do that? I’ve never noticed it to be gritty. Perhaps try using Swerve confectioners? For the ladies who have issues with the middles not setting, or being to soft in the middle after baking. 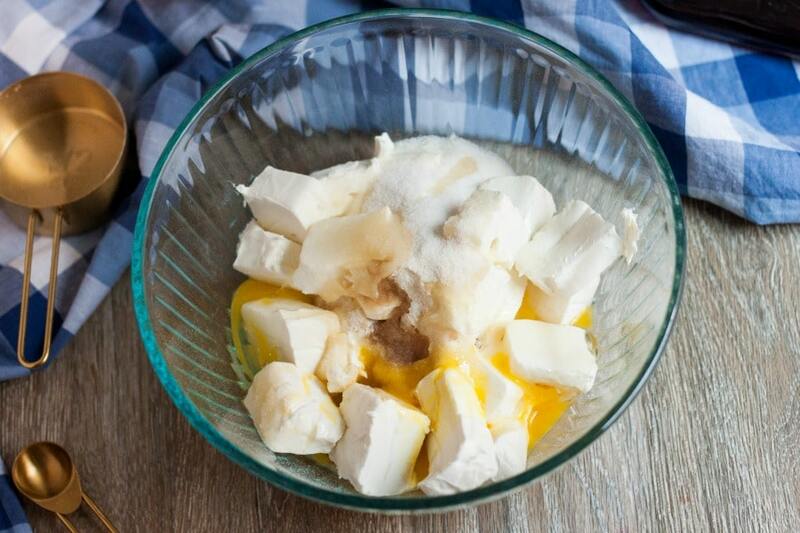 Try leaving your eggs and cream cheese out for about 30 minutes allowing them to become room temperature. 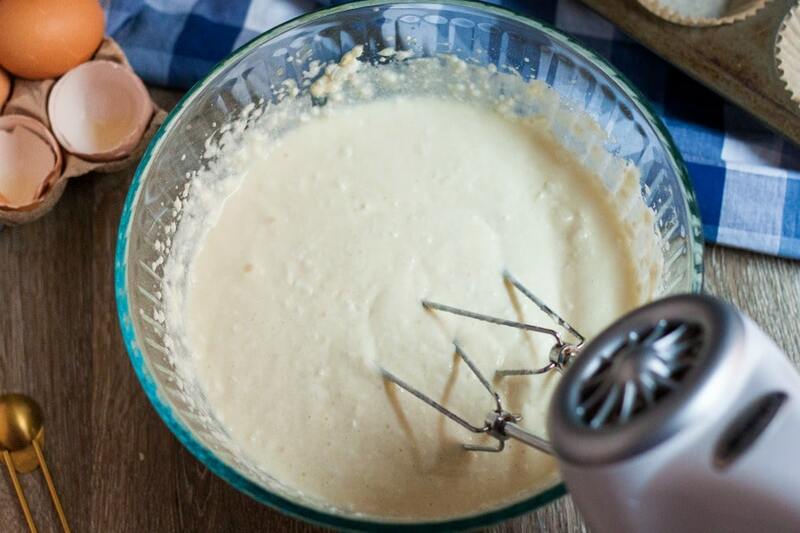 This helps to incorporate your ingredients into a more smooth consistent batter for even baking. Using cold ingredients tend to leave lumps not blended well enough to bake even causing the middles to be soft and sunk in. I put my eggs in a bowl of warm water while I’m getting my ingredients ready. By the time I’m ready to use them they aren’t cold anymore. Oh. My Gosh. These are so good. And so simple!! A friend made them over the weekend and I just gushed about them so he shared the recipe with me. Made them last night and paired with a dollop of whipped cream and some cut up strawberries. I felt like I was in heaven!! Thank you for this amazing recipe that will now be a staple in my weekly rotation!! Awesome! Glad you enjoyed them. They are a family favorite for sure. One serving is how many mini cheesecakes? The nutritional info is provided per cheesecake so that you can determine your own serving size. One serving is how many mini-cheese cakes? The nutritional information is provided per mini cheesecake so that you can determine your own serving size. Wow, sounds amazing. Going to yeti this tonight. I made these today using Jordan’s cheesecake skinny syrup and omitting the swerve. They are delicious. I topped them with some strawberries and. Tad of reddi-whip. Love this little treat. These are soooooo good!!! You should definitely eat them cold. I ate one right after it came out of the oven and it wasn’t set. I almost tossed them and figured I’d try it cold. So glad i did. Glad you waited! It makes all the difference. Just made these this afternoon, on day 5 of keto & needed to cut my sweet tooth. I cooked them about 30 minutes vs 20. Tasted one and put them back in for another 10 minutes for a total of 40 minutes. The tops are perfect but the bottom is still a little “wet” after sitting for 30 minutes, Maybe next time I’ll only use one egg but otherwise they’re delightful & will be kept in my arsenal of things to eat.